Sixteen years is a long time for a series but the Fast and Furious franchise keeps on bringing the heat and that flame is still lit. Going in I already knew what I was expecting and that was a lot of action, cars, racing, cheesy lines, and most of all a good time. I got all of that and more including some twists and turns along the way. Minus Paul Walker (RIP) many new and old faces show up: Vin Diesel, Dwayne Johnson, Jason Statham, Michelle Rodriguez, Tyrese Gibson, Ludacris, Nathalie Emmanuel, Charlize Theron, Kurt Russell, Luke Evans, Scott Eastwood, and Helen Mirren. 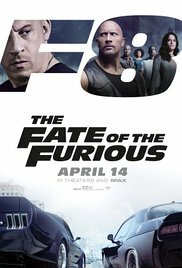 With this being the first movie other than Tokyo Drift without Paul Walker, The Fate of the Furious seemed to flow nicely and although he does get mentioned in the flick it was in a way where he didn't need to make an appearance and it was quite sad but fitting. In this installment, Dom is faced with a challenge and for the first time, he might turn his back on his family. But those around him have faith that he's doing it for some reason. Finding out that reason was a twist and a real wow moment. I enjoyed the Fate of the Furious story and all the craziness involved. I laughed at Hobbs's lines cause they are always so funny and cheesy and Roman's antics of course. I liked it when it got serious and when it wasn't. You'll all enjoy it after watching but the one thing that bugs me is how they have to work with Deckard Shaw after all the bad he has done but other than that this is the movie to see this weekend. It's a treat from start to finish, one quarter mile at a time.